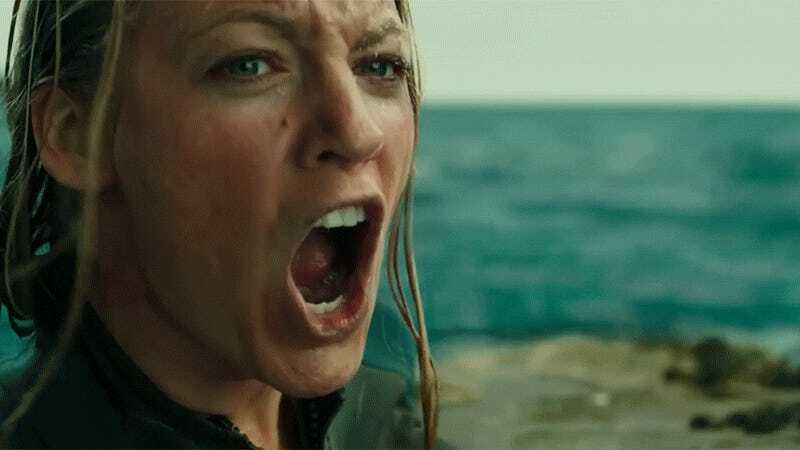 One thing you should know about The Shallows is that Blake Lively spends a lot of it—or maybe just a few minutes of it, I wasn’t timing—lying on a floating whale carcass after being attacked by an angry great white shark. Another thing you should know about The Shallows is that, apart from a few brief phone calls to her family in Texas, the only characters Lively speaks to are herself, a handful of men who don’t know much English, and a cute little seagull unable to leave her side due to a wounded wing. But the thing you should know about those two things is that they make The Shallows, out Friday, sound campier than it actually is. Jaume Collet-Serra’s The Shallows is an honest-to-god thriller—one that made me jump and cover my eyes during its most shocking and violent moments, and laugh at its most absurd (there are plenty of those). The story, as you can certainly gather from the poster, is as simple as it should be; we follow a young surfer/med school dropout (?) named Nancy Adams (imagine Blake Lively saying, “I’m Nancy Adams”) as she embarks on a solo vacation to a “secret” Mexican beach once visited by her late mother. After spending a few minutes watching Lively cathartically ride the waves and throw the shaka at some locals, she decides to hang ten one more time before calling it a day. Big mistake. Big. Huge. Lively gives a performance that would be described as “surprising” to ignorant moviegoers unfamiliar with her well-established but frequently ignored talents. (Have you seen The Age of Adaline? You should see The Age of Adaline.) She swims, she surfs, she fights, and bleeds—oh, how she bleeds—her way through the physically demanding role with a captivating intensity, and palpable desperation. Though on paper it’s always hard to imagine this statuesque mannequin of a movie star on whom clothes drape more perfectly than they could in the most lucid of Karl Lagerfeld’s dreams as an everywoman, there’s a reliable... something... to her performances that allows audiences (or at least me) to accept what she’s selling. What she’s selling now is The Shallows—an 87-minute thriller about a woman, a shark, and a seagull that just might be the most fun anyone will have in a movie this summer. And I don’t think you’d regret buying.